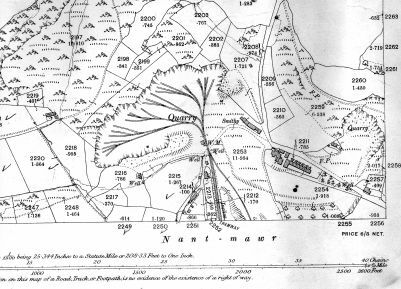 1860's map showing the Nantmawr branch line coming from Llanymynech to the limestone quarry at Nantmawr. 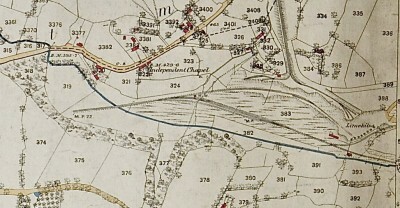 1901 map showing the expansion of the tramlines in the quarry. Note the tramline going east into another quarry has gone by this time. 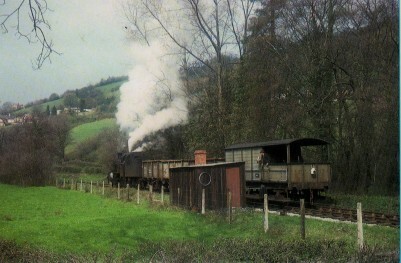 Photo of stone train reversing from the Nantmawr branch line onto the main line before heading for Llynclys Junction. 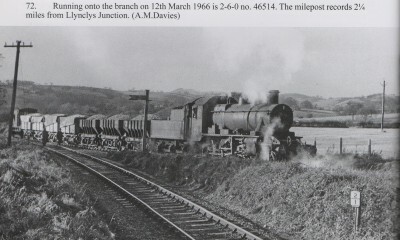 Note the mile post on the main line showing 2 and a quarter miles from Llynclys junction. This post has since disappeared but the intention is to replace it in the future. Nice scene on the Nantmawr branch line with sone being loaded into the trucks from the overhead gantry. 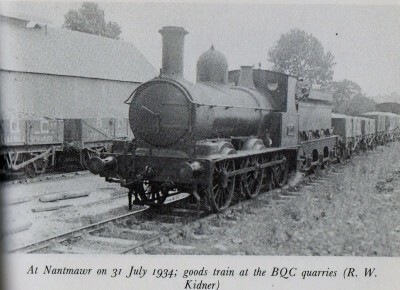 The granite stone ballast would have been brought down from Blodwel Quarry via a tramway and conveyor belt system. This has now been removed although there is a possibility of the quarry being reopened in the future when Criggon Quarry finishes. 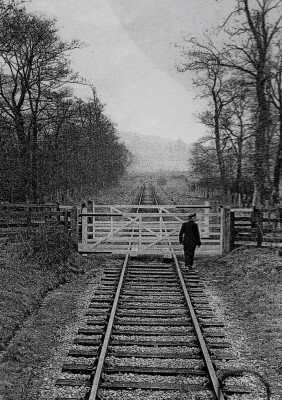 Nice view looking down the branch line at Whitegates crossing, the guard about to open the crossing gates. Lovely photo of a goods train heading up the Nantmawr branch line after having crossed Whitegates crossing. A lovely shot of the pway hut which has since gone apart from the brick chimney. Good photo of the Limekilns at Nantmawr. Someone has left a wagon dangerously close to the main line with the approaching train having to stop while the wagon is moved. Nice trackside building to the right of the track. 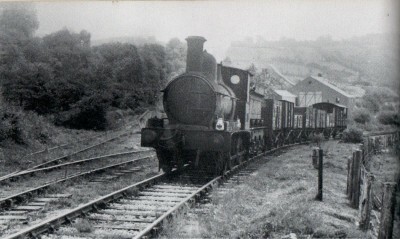 1934 photo of a goods train passing the large shed near to the limekilns at Nantmawr. 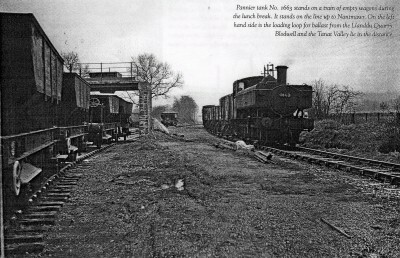 View of a goods train further up from the large shed alongside the 3 and three quarter miles milepost. 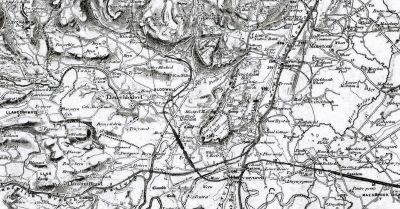 This would have been from the junction at Llanymynech. 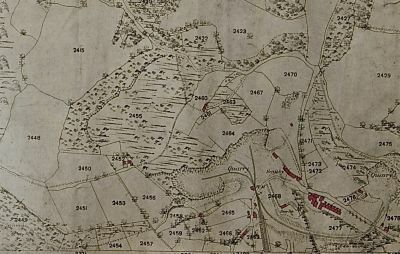 1875 map showing the area around the limekilns. You can see the lineside building in red , the large shed to the left of the kilns and the curving track going back up to the top of the kilns. 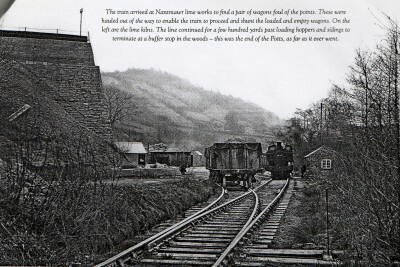 Interesting to see the narrow guage tracks coming down from Nantmawr quarry bringing the stone to the top of the kilns.